Students attend the mayor’s annual youth summer job fair at Evanston Township High School. This year, the fair included more than 30 businesses and offered more than 600 jobs to attendees. A record number of businesses attended the mayor’s summer job fair Saturday to bring employment opportunities to high school students in Evanston. The annual job fair drew its best turnout yet, said Porschia Davis, the city’s assistant youth and young adult program manager who was in charge of coordinating the event. The event is held each year as part of the mayor’s Summer Youth Employment Program and is designed to connect Evanston students ages 14 to 18 with summer jobs, according to the city’s website. The fair was put on in collaboration with the Evanston Youth Job Center and Evanston Township High School. The number of businesses present at the fair increased to more than 30, allowing for more than 600 job positions to become available to students, said Kevin Brown, the city’s youth and young adult program manager. 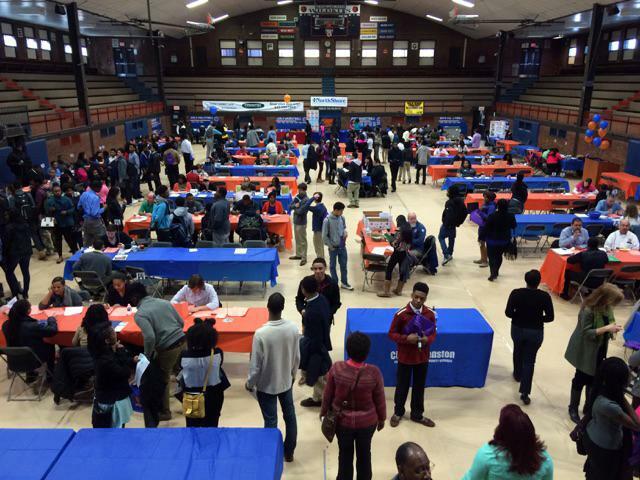 Employers from Best Buy, Northwestern, Target, and local Evanston businesses presented available job openings and interviewed interested students. This year, Brown said the youth job program extended its employer choices to include businesses outside of Evanston, such as Six Flags Great America located in Gurnee, Illinois, and privately-owned McDonald’s locations in Skokie. NU increased its participation significantly this year by offering about 27 job opportunities ranging from research positions to clerical jobs, spread throughout 13 departments at the school, said Javier Hernandez, NU’s human resources interim staffing manager. The event exceeded expectations this year, continuing the growth observed in recent years, Brown said. Three weeks prior to the fair, participants were encouraged to attend at least one of three job readiness training programs run by volunteers from the Youth Job Center, the Kellogg School of Management and local businesses, Brown said. During these trainings, students developed their resumes, practiced interview etiquette and learned about possible career options. Davis said a record number of kids attended the job readiness trainings, most likely due to a new incentive that allowed students who actively participated in the trainings to enter the fair more quickly. The program’s staff is currently working to match each student with a job position, keeping in mind the preferences of both the candidate and the employer, Brown said. He added that every job position will be filled, so most students who participate will secure a job.